I had a great day today visiting various libraries across Melbourne and in Yarra Ranges to see first hand the potential of libraries for our communities. I’m one of the Yarra Ranges councillor representatives on the Eastern Regional Library (ERL) Board, a role I share with the Yarra Ranges Mayor, Cr Len Cox. Libraries have changed a great deal since I was a girl and they are becoming vibrant community spaces full of activity and learning. It was a very inspiring trip. 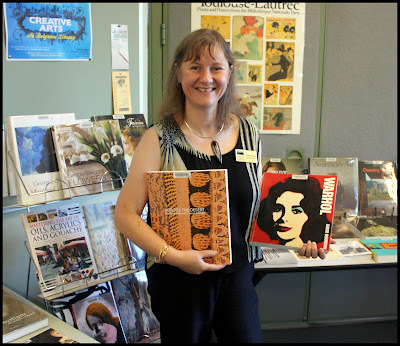 To round off the day I had the great pleasure of launching a new collection “Creative Arts” at the Belgrave Library. The collection of art books has been specifically chosen with the local community in mind and funded from the ERL new book stock budget. One thing that struck me today was that the successful libraries were those that mirrored the needs and wants of their communities. This is exactly what this new collection of art books does. We have a community with a rich history in artist endeavours of many persuasions. The collection specialises in a great diversity of art books and many people were enthusiastically gathering up many titles, keen to borrow on the night. I encourage you to have a look at the new titles which have a dedicated Creative Arts space in the Belgrave Library, I’m sure you’ll be inspired. I think the local libraries are excellent, with Belgrave one of the stand-outs. They offer so many things. I used to take Gabriel to storytime when he was a preschooler, and we still sometimes go to the holiday activities for his age group. We're lucky here with the libraries, I think. I dropped into one last time I was in England and it was nowhere near as good or community-aware as ours.